Every year college Beer Bike coordinators set aside thousands of dollars to pay the numerous petty fines Rice Program Council will inevitably charge them with. Disguised as a reasonable disciplinary policy, these fines in fact drain colleges of the money they need to run their own Willy Week and Beer Bike events. The fines do little to deter action on the part of students, are enforced arbitrarily and are an uncertain fiscal commitment colleges cannot budget ahead of time. While we acknowledge that this year’s coordinators agreed to the existing fine system without making reforms beyond slight fee reductions, we believe it is time to get rid of the current Beer Bike fine structure. As it stands, a Beer Bike security guard will see a finable offence taking place, record the offender’s college in their notebook, and do nothing to stop the offence. This is an absurd state of affairs. RPC states that the rules and fines are created to set a safety standard for Beer Bike, but simultaneously has no system in place to stop offences from continuing. If the action is worthy of a fine, security guards should intervene when they see it taking place. This could be as simple as a verbal warning. The current model does not instruct security volunteers to enforce security, but rather to collect lists of fines. If an action is not worthy of stopping, neither is it worthy of a fine. Rules broken by individuals incur fines on colleges, instead of causing the individual to take any responsibility. College coordinators may be able to communicate the rules well enough that all but a single attendee follows them. However, if that one individual breaks a rule such as “Throwing balloons outside the defined parade route (Founder’s Court)” — which includes throwing balloons onto Founder’s Court from the curb — then the college is fined $500 per balloon thrown. In this way, a college can still be charged thousands of dollars, even if the coordinators have managed to convey every fineable offense to the members of their college. Indeed, rules are often broken by alumni and guests who would have no way of knowing rules ahead of time. Testimony from Beer Bike security volunteers indicates that RPC encourages fining colleges, even if no one is doing anything wrong. One Beer Bike security guard from this year told us, “If you don’t write any fines you need to justify why you didn’t write any … this made me more inclined to write fines.” RPC itself concedes that they require this justification because they expect several individuals to violate rules each year. This policy itself indicates that RPC does not believe coordinators can reasonably stop violations from occurring. We realize that by eliminating fines, RPC will receive less money for Beer Bike. We do not believe RPC should go without compensation from the colleges. Indeed, RPC spends a great deal of money every year making sure that Beer Bike goes smoothly. 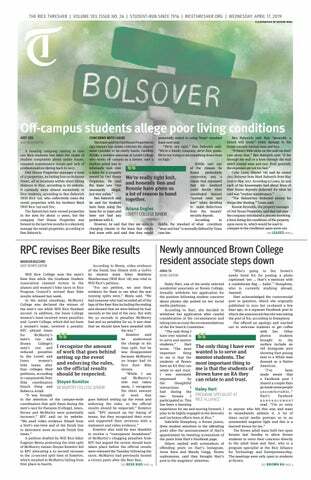 Rather, we suggest that colleges pay a set amount to RPC each year which can be factored into Beer Bike budgets ahead of time, instead of leaving coordinating teams in a $1,000-$3,000 limbo of potential fines before the event. The fine system must undergo root and branch reform. This does not mean deductions of $25 for certain fines. This means eliminating massive punitive fines for actions committed by individual students, while leaving fines that can be reasonably attributed to the negligence of colleges, such as neglecting to pick up water balloons. We also acknowledge that this system remains in place largely due to inertia, and that the current RPC leadership is not to blame. Nevertheless, the people running an event should not stand to benefit from participants breaking the rules. This ineffective incentive system should be reformed for next year.